Tic Tac Whack a Mole! Chemistry Game FREE SAMPLE! 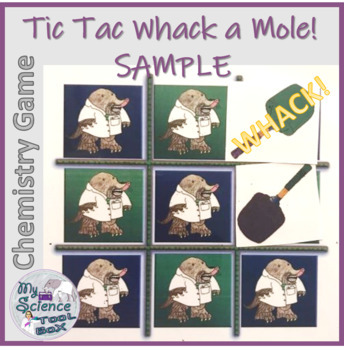 See how LOUD and FUN your classroom can be while solving MOLE problems! 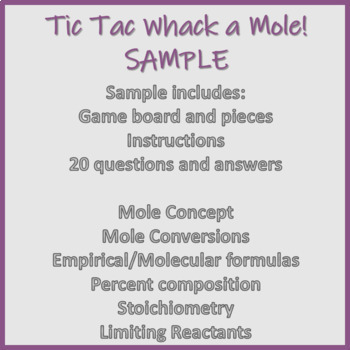 This FREE sample includes 20 questions (10 questions from each game) so your students can play the game and you can see how much fun they have racing each other to solve chemistry problems and yelling WHACK! as they play Tic Tac Toe and try to get 3 in a row. The full versions of the game include 50+ questions at varying difficulties and many different concepts so you can differentiate for different levels of students! So many questions means that you can play these games over multiple days and keep the rigor and student engagement up! The full versions also include all of the game questions organized onto worksheets so your students can practice them at home, as well as detailed worked out solutions to all the problems.